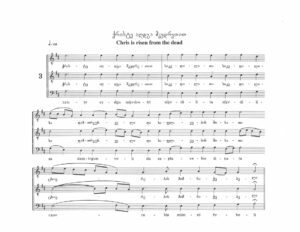 Editor’s Note: This article originally appeared on John Graham’s website featuring his tours of Georgia and Georgian liturgical music. 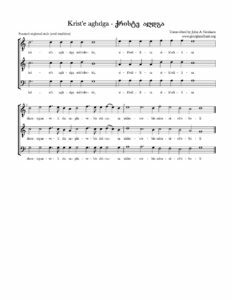 We are reposting it here because it will be of great interest and assistance to any choirs who would like to add Georgian settings of ‘Christ is risen’ to their repertoire. 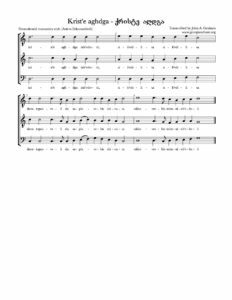 Since posting this, John has added additional East Georgian variants as well as composed 20th-century versions which you can find on his original post here. 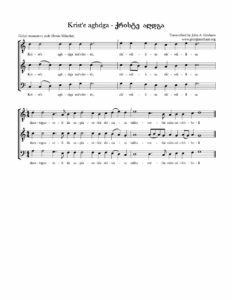 Kriste aghdga (Christ is risen) is an important Easter hymn in the Georgian Orthodox tradition. It is sung when the priest knocks on the doors of the church, symbolizing entrance to the tomb of Christ, just before entering the sanctuary space to commence the all-night liturgy service. Then it is repeated in groups of three throughout the All-Night vigil service (4-7 hours). It is also sung in every service after Easter until Pentecost. The chant survives in many musical variants, as chanters in each village and region perfected their individual style. Take a look at the following video playlists to get a sense of the diversity of the music! 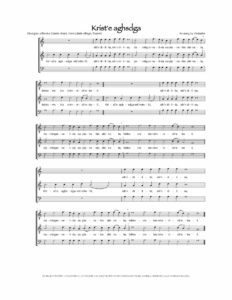 I’ve written up a number of transcriptions and posted them here for download for performance purposes only! Please credit your source. 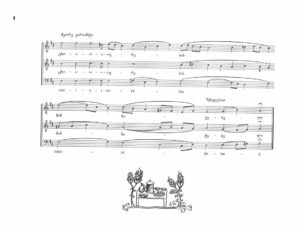 This chant book includes four musical variants of the paschal troparion, kriste aghdga (Christ is Risen). Kriste Aghdga! Christ is Risen! Cheshmaritad aghdga! Indeed He is Risen! If your international choir can get through the word mkvdretit, then you’ll be fine. ? Just kidding, the hardest to pronounce for many American speakers is the problematic ‘r’. In all cases, this is a soft, flipped ‘r’ like in Spanish. Then there is a different sound in the throat (‘gh’), that sounds like the way French pronounce ‘r’, as in the city name, Paris. mkv – these are ‘pick-up’ consonants to the sung syllable: –dre. The ‘v’ consonant ends up being pronounced like ‘f’. kh — also written as ‘x’ in phonetic alphabet, a gutteral sound that should not be over sung. If all else fails, skip it! As can be seen in the playlist of performances of this variant, it often begins with a solo sung by the middle voice. The top voice joins with the melody, while the bass harmonizes with typical Svanetian chord types (fifth and seventh intervals below the melody). Choirs often perform this chant with brusque, husky or burly sounding vocal affects, a nod towards Svan folk musical style. Performing this variant with this vocal style has somehow codified in popular imagination, such that even teenage girls (unnaturally and unnecessarily) try to mimic this style. 2) Traditional chant is sung in “close harmony”: the dissonances are integral to the desired sound. The tension-release in the music is symbolic of our prayers and supplications to God. 6) Traditional chant likewise follows strict conventions of ornamentation. By expanding the ornamentation with “foreign” flourishes, it loses the local character developed and vetted through centuries of oral tradition. Dimitri Patarava (1886-1954) was one of the last “grand-masters” of Georgian chant, an inheritor of the unique oral tradition of liturgical chant passed down for generations at the Shemokmedi Monastery in West Georgia. His variant of kriste aghdga was transcribed into European notation by his son Mamia Patarava sometime in the 1950s. It is similar to other variants from the Shemokmedi Monastery, but offers a unique take on how to harmonize the familiar melody. Note the first medial cadence on a seventh chord! This unusual cadence chord reveals itself as a brilliant segue to the second phrase, which launches with a 1-5-9 chord on the text sikvdilita…. At the third repeat of the chant, Patarava performs the words tskhovrebis mimnichebeli as an extended coda-like improvisation. The up-tempo interplay of the upper voices (two voice crossings! ), combined with the simple but solid counterpart in the bass voice demonstrates the creativity and musical genius of the master chanters: they took a simple melody and molded it into extraordinary three-voiced improvisational polyphony. Benia Mikadze (1914-1997) left a treasure of Imeretian folk songs and chants. He lived nearly his entire life in the small village of Khiblari in the Lower Imereti region, and was the last of his generation of singers raised in the oral tradition of singing in the family. His variants are entirely local, and were picked up from his parents, grandparents, and their friends. His songs and chants have been popularized by the influential choir director, Malkhaz Erkvanidze (Anchiskhati Ensemble, Sakhioba Ensemble, international workshop leader). 100+ cassette recordings of his voice singing all three voice-parts to complex chants, one after the other. In this variant of kriste aghdga, Erkomaishvili establishes a wide range by starting the bass voice at an octave below the melody. 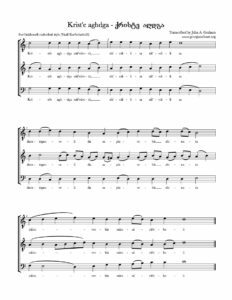 This allows both of the lower harmonizing voices to improvise with a range of flexibility, resulting in dramatic ascending and descending lines in the bass voice especially. Harmonically, Erkomaishvili favored the 1-5-9 chord for all strong moments. This can be seen at the beginning of the second phrase on the word sik’vdilita, and the fourth phrase on the word tskhovrebis. Arguably, the 1-2-9 chord at the beginning of the third phrase on the word damtrgunveli is a variant of his favorite 1-5-9 chord. The melody of the Karbelashvili variant is the same as the West Georgian variants, but the lower voices are quite different. The middle voice displays the kind of ornamentation favored in East Georgia: a flowing line that passes between one chord and the next. The tempo should be on the faster side, between 100-120 beats per minute (quarter note), but not so fast that the middle voice passing tones seem aggressive or forced. Karbelashvili chant should have a feeling like a large slow river, moving surely, steadfastedly, with pride, majesty, and inexorable inevitability towards the cadence. Individual chords are not prioritized, but rather the entire motion of the phrase, sung in one breath. Lechkhumuri variant, recorded in a WWI German prisoner-of-war camp between 1916-1918. Georgian choirs tend to change their performance technique based on the variant. For example, the Svaneti variant is often sung in a very strong brusque voice, perhaps trying to emulate Svanetian folk singing. The Erkomaishvili and Patarava variants from the Guria region (Shemokmedi monastery style) are often sung by trios similar to the folksong trio genre popularized by these very singers in the early 20th century. As a choir director, one has to make choices between trying to preserve some “authentic” performance practice, and being realistic about the capabilities of one’s choir members. Calling something “authentic” is of course problematic because there was so much variation even within the known traditional-singing community in the early 20th century. That disclaimer aside, here are some suggestions. – men, women, or children can sing, but it must be “close” harmony. Doubling at the octave is an imported musical feature. – timbre should be natural (tenors and sopranos in their mid-range, altos and basses in their mid-range). This is why most Georgian choirs, given the choice, elect to sing TTB, or SSA, rather than mixed gender choirs.